It's time for the new challenge at 613 Avenue Create! This week's optional twist is "Black and White and you Favorite Color". 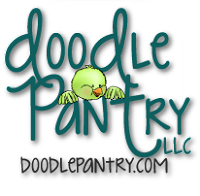 This week, I'm working with one of our generous sponsors - Doodle Pantry. The image I've chosen is called "Big Bear Hug", and I've colored the image using only white, 50% cool gray, and black colored pencils. Currently I've been a bit obsessed with an Aqua Mint shade, so I've mixed that shade of cardstock in with papers from the Colorbok Chateau Noir Paper Pack. The corners of the aqua mint cardstock are punched with a Fiskars corner punch. I dotted around my image with Black Enamel Accents, added a bow with ribbon from my stash, some white and gray daisies from Michael's and a sentiment which was stamped from the Simon Says Stamp Apothecary Labels Stamp set in black Stazon ink. Ohhhh...I just love this card. What a sweet image and I love the monochromatic feel to it. Sooo nice. Thanks for playing along with us at Lil Patch of Crafty Friends. Hope to see you again soon. So adorable Sara! Love it! Sweet image! Gorgeous DP and embellishments. So cute and adorable! Thank you for entering Design Team Showcase.